My ever present, ever watching Toddler began to take piles of clothes behind our curtains, exclaiming to the room that she was “just going to see if they fit” and that she’ll “be right back”. 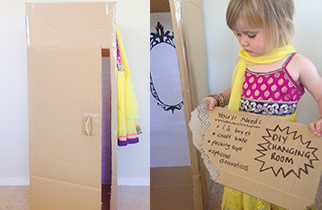 I decided to one up her imagination and turned a humble cardboard box into a changing room, fulfilling all of her wildest dreams! It was really easy to make, so I thought I’d share the process with you in the hopes It’ll inspire you to go along with your little peoples play and do some taping and cutting of your own! This would make such a great addition to your dress up box play space, and a tool to convince little people to get dressed in the morning and night time! Stand your box up onto your extra cardboard and trace around the square base, cut this extra cardboard out and tape it to your base. This will stop your box collapsing when little people are inside it! Decorate as you please! I stuck white paper on the inside and drew some clothes on the door which I let her colour in and decorate. I also drew a mirror on the inside. Previously I stuck tin foil on the inside as a “mirror”, but it was promptly ripped down, if you went for that option you would need to Modge Podge or clear film seal it! Why not make a sign for their own? Or extra cards as “item counters” to put on the outside when they take clothes in? You could practice counting different clothing! Or make a cardboard hook on the inside to hang little coat hangers on? As you can see my little girl LOVES hers and its a big hit for play time, as well as “we seriously need to get dressed right now” time! Let me know if you end up making one of these, and keep your eyes peeled to the EziBuy blog for more humble cardboard box ideas! If you have any grand ones, leave me a comment to let me know your favourites!